A devout centre on the banks of River Bhima, Pandharpur in the state of Maharashta boast of a rare combination of tradition and history. Famed as the religious capital of Maharashtra state, this quite town speaks about the grace of a benevolent God, who descended down to earth to be with his ardent devotee. This quaint little habitat is all set to allure the devotees with the legendary story of Lord Vitthal and his beloved devotee Pundalik. The popular belief is that the God had visited this place to see Pundalik and he had to wait outside Pundalik’s residence for quiet sometime since the latter was busy serving his aged parents. 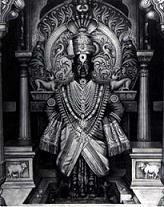 Later Pundalik came before the lord and seek his pardon. Pleased by his devotion towards his parents the lord decided to stay with Pundalik forever and ever since the lord stays there in the village. A bevy of lovely shrines that conjure up exquisite devoutness and sculptural grandeur are the foremost lures in this sleepy town. Pathanpur protects its long history and tradition through these pretty places of worship and legendary stories. What to do in this holy abode of Lord Vitthal is a redundant query, since Panthapur offers enormous pastimes to the devotees and the casual visitors alike. The devotee would be well pleased with the saintly ambiance of the holy shrines, while the casual visitors can enjoy the scenic environ of riverside. The riverbed proffers a nice setting for boating. As the most sought after destination of vaishnavite traditions, the devotees usually indulge in the longest Parikrama namely Alandi-Pandharpur Yatra. You can submit your travel blog to be listed in this exclusive hand-picked list. Optional. Email ID will not be displayed on the website.